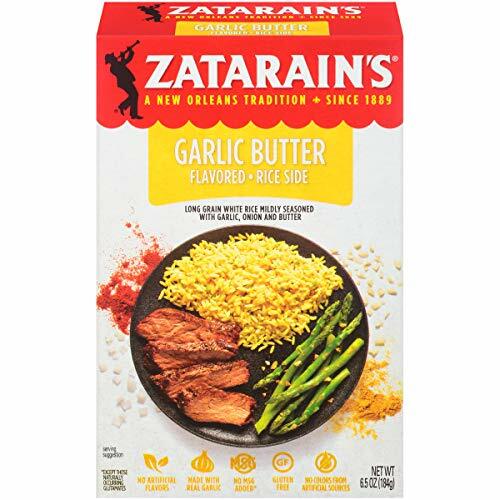 Zatarain's - Zatarain's garlic & butter Rice Mix brings authentic New Orleans-style flavor right to your kitchen. Can be made on the stove top or in the microwave. This rich, moist rice mix contains long grain white rice with garlic, onion and natural butter flavor that will have your family scraping the plate. Serve as a side dish or complete meal by adding chicken or sausage. Prepared and on the table in less than 30 minutes. Gluten free. Serve alone as a refreshing side dish or use mix to create a mouthwatering meal by adding chicken, and in under 30 minutes, sausage or veggies, your family can enjoy the flavor and soul of The Big Easy! Features long grain white rice seasoned with garlic and natural butter flavor. Zatarain's - Gluten free. Just add one pound of meat or shrimp. Prepared and on the table in 30 minutes. Zatarain's jambalaya rice Mix, 8 oz Case of 12 Traditional Creole dish. Enough to feed your family and then some. McCormick - 100 percent cholesterol free. Just add one pound of meat or shrimp. Enough to feed your family and then some. Gluten free. Serving Size: 14 gram. Contains zesty spices, flour and vegetables. Just add the meat of your choice and pour over rice. Prepared and on the table in 30 minutes. Requires only 15 minutes of prep time! Zatarains Gumbo Base, 4. 5 ounce -- 12 per case. Mix makes creating traditional Creole gumbo easy! Serving per Container: 9 Traditional Creole dish. Zatarain's - Just add the meat of your choice and pour over rice. Prepared and on the table in 30 minutes. Serve alone as a savory side dish or make this mix a hearty meal by adding sausage, and in 3 minutes, you can enjoy the flavor and soul of The Big Easy – without the guilt! Traditional Creole dish. The easiest way to bring the bold flavor of New Orleans to your table is to make sure Zatarain's is in your pantry! Contains zesty spices, flour and vegetables. Enough to feed your family and then some. Makes a quick-and-easy side dish or meal in less than 30 minutes! Contains 25% less sodium than original Red Beans and Rice Mix. Requires only 15 minutes of prep time!25% less sodium than our original Red Beans & Rice. 8 ounce Pack of 6. ZATARAIN'S Reduced Sodium Red Beans and Rice, 8-Ounce Pack of 6 - Can be made on the stove top or in the microwave. Zatarain’s red beans and Rice Mix brings authentic New Orleans-style flavor right to your kitchen. Serve as a side dish or complete meal with the addition of meat. 100 percent cholesterol free. Known as a traditional monday meal, bell peppers, pre-cooked red beans, this rice mix contains 25% less sodium than original Red Beans and Rice Mix and features long grain white rice, tender, onions and seasoning. Zatarain's - Can be made on the stove top or in the microwave. This savory side dish boasts an exciting blend of flavors that includes turmeric, onion and red pepper. Makes a quick-and-easy side dish or meal in less than 30 minutes! Prepared and on the table in 30 minutes. Yellow rice, or arroz amarillo in Spanish, is a culinary staple in nearly every Latin American culture. 100 percent cholesterol free. 25% less sodium than our original Red Beans & Rice. Prepared and on the table in less than 3 minutes. Serve as a side dish or complete meal with the addition of meat. Can be prepared on the stove top or in the microwave. Prepared and on the table in less than 30 minutes. Contains zesty spices, flour and vegetables. Zatarain's Yellow Rice Family Size, 12 oz Pack of 8 - Mix makes creating traditional Creole gumbo easy! Features long grain white rice and tender red beans and seasoning, including hickory smoke flavor. Gluten free. It is commonly served as a simple side dish or, more famously, simmered with chicken and other ingredients to create arroz con pollo. Features long grain white rice lightly seasoned with garlic, onions and bell peppers. McCormick & Co - Prepared and on the table in 30 minutes. Serve as a side dish or complete meal with the addition of meat. 8 ounce Pack of 6. Just add the meat of your choice and pour over rice. 25% less sodium than our original Red Beans & Rice. The popular flavor combo compliments everything from tacos, fajitas and burritos to chicken, beef and seafood. Makes a quick-and-easy side dish or meal in less than 30 minutes! Traditional Creole dish. Prepared and on the table in less than 30 minutes. Gluten free. Add 1 pound of cooked ground beef for a quick and easy filling for burritos. Prepped on the stovetop or in the microwave, it's a convenient way to bring a restaurant favorite home. Zatarain's Cilantro Lime Rice Mix, 6.9 oz Pack of 12 - Requires only 15 minutes of prep time! Perfect side dish to compliment fajitas, tacos, meat and seafood. Bursting with freshness, this easy-prep side dish takes inspiration from vibrant cilantro and zesty lime. 100 percent cholesterol free. Packaged in the USA. Contains 25% less sodium than original Red Beans and Rice Mix. Zatarain's - Can be made on the stove top or in the microwave. Prepared and on the table in 30 minutes. Features long grain white rice lightly seasoned with garlic, onions and bell peppers. Just add one pound of meat or shrimp. Mix makes creating traditional Creole gumbo easy! Prepared and on the table in less than 3 minutes. 3 - 7 oz 198g boxes - Gumbo Mix with Rice. Features long grain white rice and tender red beans and seasoning, including hickory smoke flavor. Contains zesty spices, flour and vegetables. A new orleans Tradition Since 1889. Enough to feed your family and then some. Gluten free. Makes a quick-and-easy side dish or meal in less than 30 minutes! Zatarain's Gumbo Mix With Rice, 7 Ounces - Pack of 3 - Contains 25% less sodium than original Red Beans and Rice Mix. Considered a staple of Cuban cuisine, it can be served as a side dish or complete meal. 100 percent cholesterol free. Stove Top or Microwave. Gluten free. Prepare on the stovetop or in the microwave. Zatarain's - Add 1 pound of cooked ground beef for a quick and easy filling for burritos. 8 ounce Pack of 6. Prepare on the stovetop or in the microwave. Packaged in the USA. This comes with precooked beans and is ready in less than 30 minutes. Features long grain white rice and pre-cooked black beans. 25% less sodium than our original Red Beans & Rice. Zatarain’s black beans & rice is flavorful but not spicy and goes great with a variety of meats, but is hearty enough to stand alone as a meatless entrée. Perfect side dish to compliment fajitas, tacos, meat and seafood. No single culture owns beans and rice. Features long grain white rice lightly seasoned with garlic, onions and bell peppers. Zatarain's Black Bean & Rice, 7 oz Pack of 12 - Our black beans & rice is rooted in the Caribbean, where the combination of savory black beans and fluffy rice is a daily staple. Considered a staple of Cuban cuisine, it can be served as a side dish or complete meal. It’s a natural pairing that likely developed independently in different parts of the world. Stove Top or Microwave. Prepared and on the table in less than 30 minutes. Requires only 15 minutes of prep time! Zatarains - Bring a classic New Orleans dish home to your table. Contains zesty spices, flour and vegetables. Traditional Creole dish with Caribbean influence. 25% less sodium than our original Red Beans & Rice. 100 percent cholesterol free. In 1889, he obtained the companys first product trademark and started to market root beer. Stove Top or Microwave. Can be made on the stove top or in the microwave. 3 - 7 oz 198g boxes - Gumbo Mix with Rice. Long grain white rice with cilantro and a hint of lime. Gluten free. 100% cholesterol free cooks in 30 minutes. Add chicken or sausage for traditional gumbo flavor. Zatarain, Sr. Packaged in the USA. Long grain white rice in a Rich, Seasoned Roux with Red and Green Bell Peppers. Zatarain’s Gumbo Base, 4.5 Ounces Pack of 3 - The tradition for making zatarains amazing New Orleans style products was started well before the turn of the century by a man named Emile A. Features long grain white rice lightly seasoned with garlic, onions and bell peppers. Just add one pound of meat or shrimp. Perfect side dish to compliment fajitas, tacos, meat and seafood. Zatarain's - Spanish rice is popular for its flavor and versatility. Zatarain's New Orleans Style. Gluten free. Just add hot water! more than 1, 500 years ago, North African immigrants brought rice to Spain, where the crop thrived.100 percent cholesterol free. Gluten free. A new orleans Tradition Since 1889. As spanish rice. Features long grain white rice and tender red beans and seasoning, including hickory smoke flavor. Serve alone or as a hearty side dish, no matter what your family will be full and happy. Add chicken or sausage for traditional gumbo flavor. Can be made on the stove top or in the microwave. 25% less sodium than our original Red Beans & Rice. Perfect side or main entrée just add meat. Traditional Creole dish. Zatarain's Dirty Brown Rice Mix, 7 oz Pack of 12 - Packaged in the USA. Add 1 pound of cooked ground beef for a quick and easy filling for burritos. Gluten free. Serve as a side dish or complete meal with the addition of meat. Zatarain's - Just add the meat of your choice and pour over rice. Long grain white rice in a Rich, Seasoned Roux with Red and Green Bell Peppers. Features long grain white rice and tender red beans and seasoning, including hickory smoke flavor. Add chicken gizzards and livers for a true traditional meal. Gluten-free, no artificial flavors and no MSG. Zatarain's New Orleans Style. Serve alone as a satisfying side dish or make this mix a hearty meal by adding cooked sausage or ham, and in 90 seconds, you can enjoy the flavor and soul of New Orleans! Traditional Creole dish. Add chicken or sausage for traditional gumbo flavor. Prepared in 90 seconds. Just add one pound of meat or shrimp. Zatarain's New Orleans Style Big Easy Red Beans & Rice Mix, 8.8 oz Pack of 8 - Mix makes creating traditional Creole gumbo easy! Made with enriched wheat flour, dried vegetables, and garlic. The big easy just got a little easier and more flavorful with Zatarain's Big Easy Red Beans & Rice Mix! Known as a traditional Monday meal, this easy-to-prepare rice mix features seasoned white rice with tender red beans, bell peppers and spices. Can be made on the stove top or in the microwave. Great with sausage. Packaged in the USA.